What is a City Development Strategy and what are its benefits? What is a City Development Strategy? A City Development Strategy (CDS) is a tool that helps a city harness the potential of urbanization through strategic planning. It is an action-oriented process, developed and sustained through participation, to promote equitable growth in cities and their surrounding regions to improve the quality of life for all citizens. A CDS helps cities integrate a strategic development approach and a long-term perspective into their urban planning. 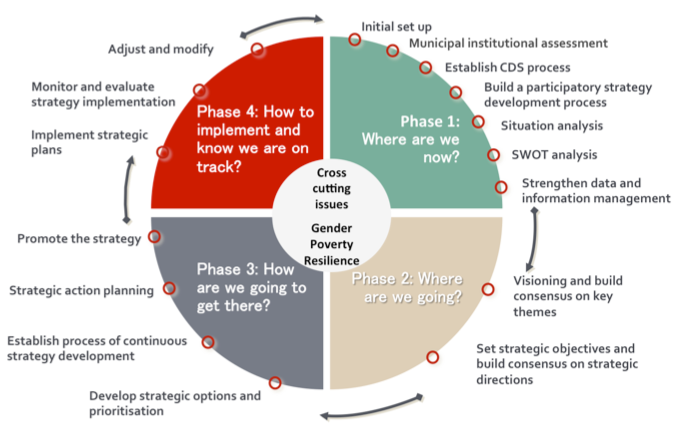 The idea behind a CDS is that “well-positioned, well-timed public, private and civil society strategic interventions can significantly change a city’s development path and improve its performance” . A CDS is not only concerned with developing a strategy but also with its implementation and the sustainability of initiatives through integrating operation and maintenance issues into the whole process. http://www.citiesalliance.org/about-cds (Accessed 30 March 2016). The process of a CDS also includes cross-cutting issues that are relevant to all phases. Much has changed in the external context in which cities have been operating since the first CDSs were implemented almost two decades ago. Global macroeconomic pressures have multiplied following a serious financial crisis in the Western world at the end of the first decade of the 21st century. The economic uncertainty has now also spread to emerging markets, and countries in Africa, Asia and Latin America face a slowdown in their exports of commodities, lower commodity prices, and a weaker economic outlook, thus compounding their political challenges. The more difficult global outlook affects cities in myriad ways, from growing poverty and migration from rural areas and surrounding countries to lower revenues and a weaker business climate. Meanwhile, environmental challenges, climate variability, and natural disasters are increasing in intensity. This increased uncertainty is putting a premium on resilience and the search for durable solutions to complex and compound environmental, economic, political and social challenges. In this highly unstable global environment, the CDS remains a very relevant process and tool to help local governments and their development partners build resilience and lay the basis for economic growth, more cohesive communities, and improved living environments. It does so in two critical ways: by building a constituency for better planning and change through better cooperation between government departments and meaningful participation of residents and the local private sector (improving process) and by delivering results on the ground in areas that matter to these residents and local private actors (improving outcome). A strategy is a design or idea used to accomplish a specific goal. A strategy is flexible and open for adaptation and change when required. In this sense, it is different from a conventional “plan”, which—in most contexts—is a fixed program or scheme for a definite purpose. A plan is very concrete in nature and does not allow for deviation . Strategic planning is a process that involves the development of a long-term (usually multi-year) roadmap comprised of a set of specific goals, objectives and actions. A strategic plan is founded on a vision that sets a clear path to the future, but which also incorporates the flexibility to adapt the vision as time passes, and as needs require . Most forms of strategic planning address at least three key questions: Where are we? Where do we want to be? And how do we get there ? The first question (Where are we?) is answered through an analysis of the present situation. The second question (Where do we want to be?) is addressed by a vision of the future, supported by realistic objectives. The third question (How do we get there?) is answered through the development of strategic options and/or a strategic action plan. A fourth question (How to implement and know if we are on track?) concerns the implementation, operation and evaluation of the strategic options. Political will: A strategic plan is only as strong as its advocates. Strategic planning at the local government level can only succeed if it has the unequivocal support of the chief executive, legislative body and affected department heads . The political will needs to be strong enough to mobilise and coordinate the use of the resources necessary for implementation and operation and maintenance. Participation: Stakeholder groups should be mobilized or created for continuous consultation and, at a later stage, for providing feedback into the planning process (UN-Habitat 2010, 3). There are several different levels of participation. Forms of participation that actively engage stakeholders in planning decisions help to empower them. At the same time, they are more likely to ensure contributions from different groups in society and they also result in feedback that can help to improve planning decisions. Partnership: Local governments cannot do everything on their own. The better the partnerships, the better the strategy. The basic premise behind a partnership based strategic planning process is that traditional top-down decision-making and delivery mechanisms without the involvement of relevant stakeholders are inadequate in the face of the complex challenges faced by local governments . VNG International, 2010: Municipal development strategy process : a toolkit for practitioners, p.10 [Accessed 29 August 2016]. DiNapoli, T. P., 2002: Local government management guide : strategic planning. New York: Office of the New York State Controller, Division of Local Government and School Accountability. Available at: https://www.osc.state.ny.us/localgov/pubs/lgmg/strategic_planning.pdf, p.1, 8 [Accessed 9 September 2016]. UN-Habitat, 2010: Citywide strategic planning : a guideline. Nairobi: United Nations Human Settlements Programme (UN-HABITAT). Available at: http://www.gltn.net/index.php/publications/publications/send/2-gltn-documents/17-citywide-strategic-planning-a-guideline-eng-2010, p.5 [Accessed 9 September 2016]. DiNapoli, T. P., 2002: Local government management guide : strategic planning. New York: Office of the New York State Controller, Division of Local Government and School Accountability. Available at: https://www.osc.state.ny.us/localgov/pubs/lgmg/strategic_planning.pdf, p.1-2 [Accessed 9 September 2016]. VNG International, 2010: Municipal development strategy process : a toolkit for practitioners. The Hague: VNG International. Available at: http://www.vng-international.nl/wp-content/uploads/2015/06/Toolkit_Municipal_Development_Strategy_Process_ENG.pdf, p.12 [Accessed 29 August 2016]. Helping cities visualise the bigger picture: Strategic planning can help cities transcend short-term pressures and “emergencies” and focus on vital longer-term priorities. Helping provide a strong framework for investment: A strategic plan provides a well thought out framework that for investment planning and budgeting. It deals with both capital investments and operations. Strategic planning yields results: A strategic plan should provide a realistic framework that is built upon a foundation of constant improvement. Built into the plan are milestones that help gauge progress. Strategic planning is adaptable to a changing environment: It can provide a framework that is flexible enough to accommodate change, while at the same time, strong enough to adhere to a local government’s basic mission and objectives. Strategic planning is responsive to citizens’ needs: A successful strategic plan includes priorities that are important to the citizens. Participation: A good strategic plan involves people at all levels of government, the business sector, civil society and the public. By involving more people among the various levels, cities can foster teamwork and a sense of ownership. Tailor-made roadmap: A strategic plan allows for specific objectives and parameters that are specialized and appropriate to the city, its population, and the local government’s mission. Adaptability: Elements contained within a strategic plan represent an on-going process that is designed to be refined based on changing internal and external conditions. Accountability: A solid strategic plan with definite objectives, financial targets and monitoring tools in place, can provide a sound basis for accountability. Adapted from DiNapoli, T. P., 2002. Local government management guide : strategic planning. New York: Office of the New York State Controller, Division of Local Government and School Accountability. Available at: https://www.osc.state.ny.us/localgov/pubs/lgmg/strategic_planning.pdf, p.8-9 [Accessed 9 September 2016]. A development strategy should use the best scientifically backed information possible, but in the end a strategic planning process remains more of an art than a science. It is important to be clear at all times on the objectives. How the objectives are reached will differ between cities and at different times in the same city. The success of a CDS process will depend ultimately on resources, culture and capacity. This toolkit aims to provide a framework and a guide—but does not provide a rigid blueprint where “one size fits all”. Is your city ready for a CDS? Take the test!